... are buried in this pile of leaves? Using the dry time in the morning, the kids helped up us process some Oregon Grape (Mahonia aquafolium) to make medicine and/or hand wash with in the future. They used butter knives to carve the berberine-rich, and beautiful bright yellow inner bark to collect for medicine. What a treasure we have amongst the undergrowth of our NW forests! I also appreciate the chance to work with a knife with the younger kids in a safe way. This is great practice for working with a sharp knife and it is great to see such focus from our wild boys! After that hard work, we needed to run our bodies in the sunshine and Run, Rabbit, Run is the perfect game for that! Somehow it morphed into “Fly Turkeys, Fly” with the traditional T-rex (Thanksgiving Rex) trying to eat the turkeys… Don’t ask me, sometimes these games and stories have a life of their own! All I know is there was some giggling coming from warm bodies as we ran around the meadow. The leaves have all fallen and are thick under Story Tree these days! 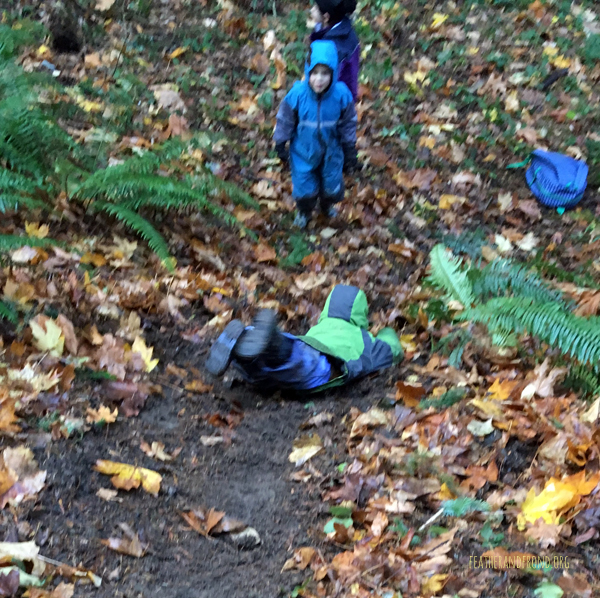 We couldn’t resist being buried under them… I let the kids bury me first to show it was safe (and warm!) then it was hard to get them out of there! 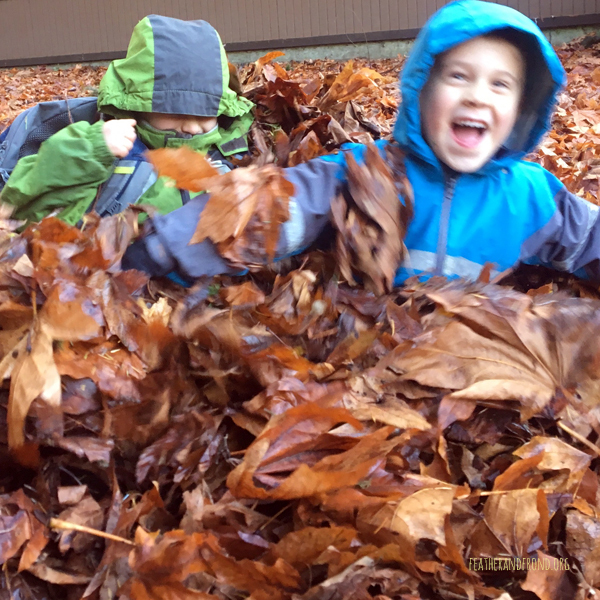 This is great fun and also a survival skill in action — we learned from Douglina the Squirrel last week that you can never have too much duffy debris in your survival shelter… Melissa and I have even slept in duff beds where you pile a super thick pile of leaves, ferns, conifer needles, etc. and bury yourself in the middle. You would be surprised how much heat a bunch of forest debris can hold! Heart Home is such a magical little place that our Fox Walkers have found and built! It is close to the front, but feels really deep and hidden. It is a marvelous container for our big energy! 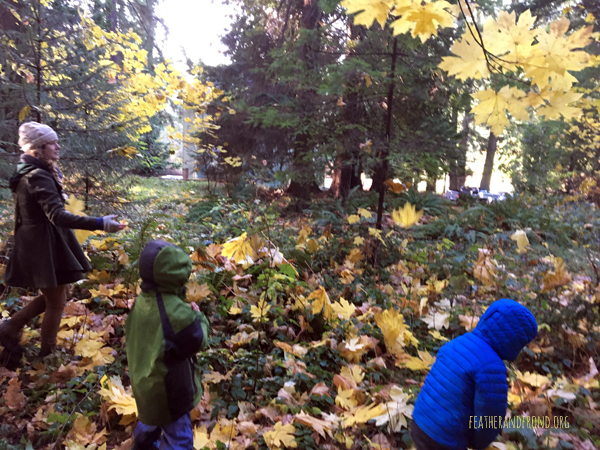 At some point this week a magical game came about where the kids (and grown ups) were transformed into magical salmon and bear and foxes — it was pretty elaborate, I would suggest asking your Fox Walker about it and seeing what they remember. Near the end of our day just before having a little sit spot time, we were actively burning off the rest of our big energy climbing up and Otter sliding down a hill when I found ANOTHER salamander under a log! This appeared to be an older Ensatina and was much larger (maybe the size of my entire pinkie). This was pretty exciting as we have looked for Salamanders all year at Whatcom but these are the first we found! Hooray for Nature Surprises! Enjoy the week at home with family, we are grateful for our little pack of Fox Walkers! See you December 1st!